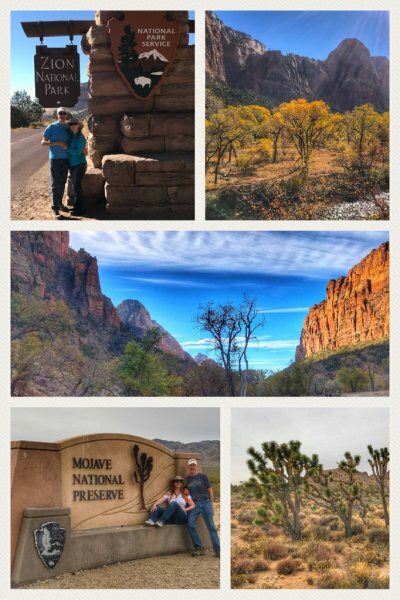 While the real #JenRanAdventures does not begin officially until January 10, 2018, we decided to take a long weekend trip to Zion National Park, Utah, and the Mojave National Preserve, California. Zion National Park, located in southwest Utah, near Springdale, is a 146,000+ acre preserve established in 1919. The park is known for its brightly-colored Navajo Sandstone cliffs and outcroppings within a deep canyon along the Virgin River, but there is much more to the park, including desert, riparian, and forested areas. We hiked two trails while there (Riverside and Emerald Pools), and visitors can find plenty of hiking adventures, as well as rock-climbing and picture-taking. 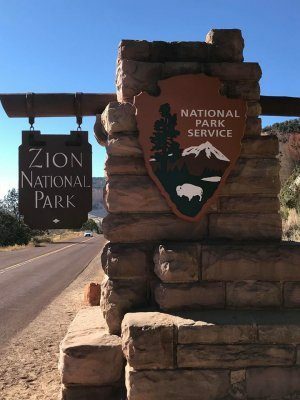 Be prepared to use the free park shuttle during the busiest times of the year… and when you’re done, consider driving the Zion Park Scenic Byway (along Hwy 9). As for lodging, we did not take our little trailer on this trip. In Zion, we chose to stay at the Zion Lodge within the park. It was built almost one hundred years ago, and the buildings fit nicely into the natural surroundings. The rooms were fine (the beds not so much), and we were delighted by the visiting deer outside our first floor deck. While at Mojave, we stayed at the historic Hotel Nipton, part of a wonderful and crazy little place that has big plans for transforming from an old mining and ranching town to becoming a mecca for tourism and the growing marijuana industry. Best part of our stay: it’s located right next to the train tracks and we saw and heard trains all day and night.